This week my refrigerator and pantry are fully stocked. Even better, I have a variety or beans and grains already cooked and very little processed junk in the house. This makes meal planning easy, I could make any of our favorites fairly easily. The truth is, I like the challenge of making delicious meals when we only a few things left. When we are running low on our go-to ingredients my husband will want to go to the store to replace them but sometimes I try to wait it out just a little longer. Some of the best recipes are created out of scarcity, rather than plenty. Breakfast this week will rely on potatoes. I have 5 large baked potatoes in the refrigerator. Breakfast Tacos or Burritos and Gluten-free Savory Breakfast Muffins both rely on potatoes and taste great as leftovers. 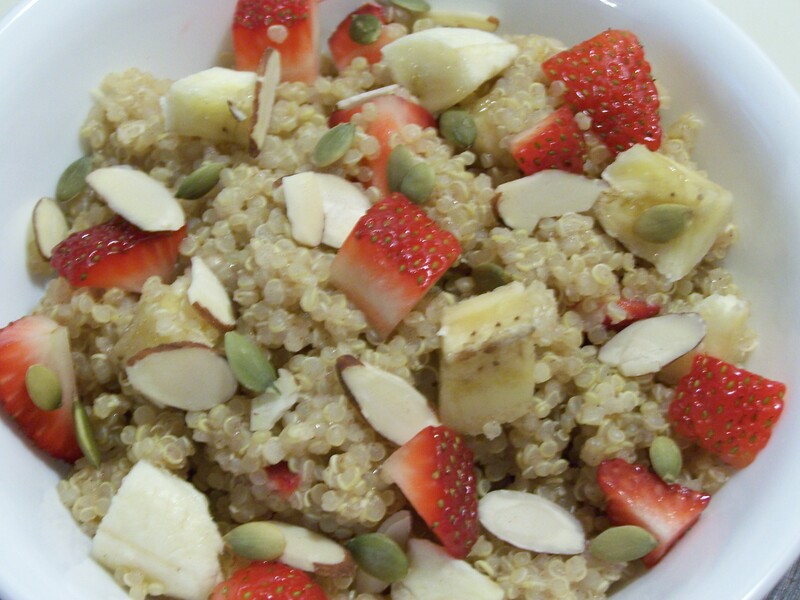 We may have oatmeal or Breakfast Quinoa with fresh strawberries as well. Lunch will be a variety of Bean and Grain Bowls. Black Beans & Quinoa or Pinto Beans & Rice topped with salsa or a combination of fresh tomatoes, onions, peppers and avocado. Baked Potatoes topped with beans & greens and a little nutritional yeast can really hit the spot. All of these easy combinations that can be packed up and reheated at lunch time. Fully loaded salads, like this BBQ Chickpea Salad, are another good option if you have the time, it always takes me a long time to eat salads. When I put it in a wrap I can eat it much quicker. Sandwiches are also a quick and easy standby. Snacks can be as simple as a hand full of walnuts and apple slices or slightly more time consuming like a yogurt (non-dairy) parfait. We also like green smoothies occasionally for snack. I am most satisfied by apples dipped in peanut butter, it gives me a jolt of energy, tastes great, and is quick and easy. I use almond butter for my youngest who has a peanut allergy. Dinner is still a little up in the air this week. We have a dinner/celebration we are attending on Friday and I have the privilege of helping with a small part of it. There will be a few people attending with allergies or other food restrictions and I’m providing some of the food. I’m so excited! I’m still waiting on the final count. On the home front, my husband has requested Broccoli and Brown Rice Casserole; this is an easy recipe and a family favorite (and we always have leftovers). To take advantage of this perfect grilling weather I’m thinking about Portobello Steaks (using this Mushroom Marinade), Dirty Mashed Potatoes, and green beans. Taco salad or burritos using Quinoa-Lentil Taco “Meat” along with fresh salsa, beans and avocado is one of my favorite combinations. I may even use fresh cilantro from my garden. The leftovers can be stuffed into peppers and baked or grilled. Lastly, I may make a pot of soup or chili before it is too hot; they all look so good I’m having a hard time deciding. I usually make soup toward the end of the week when I want to use up random veggies and clear our the fridge. I don’t normally write about dessert but this girl is in need of some chocolate. I also have a few dessert type recipes I’m experimenting with. I’ll share any progress on Facebook. What are you eating this week? Are your supplies fully stocked? Any My Plant-Based Family recipes? You are invited anytime Brittany! I’ll even take requests!